We are happy to announce that our website now has a brand new Video Section. The site will host a number of various videos in different categories, including How-To guides, product information and company updates. 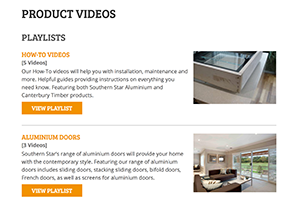 Southern Star Aluminium and Canterbury Timber windows and doors will both be featured, with a total of 7 videos currently available to view across all categories. Our new video section is also hosting videos created by the Australian Window Association. As installation continues to be a major problem for the performance of windows and glazed doors throughout Australia, in response to 'failed window and door systems' that are discovered to actually be the result of poor installation, the AWA has developed a series of videos detailing installation procedures and techniques. More videos will be added to the section, so be sure to keep an eye out for new additions.